The March 2010 release of the new book TIGERS Among Us is now re-released for digital readers and details how four outstanding companies use six simple TIGERS collaboration principles to excel—and your business can too. Bend, OR (10/19/10)…What makes a good company great? TIGERS Among Us: Winning Business Team Cultures and Why They Thrive, reveals what four successful companies have in common that makes them thrive in any economy. “I help remove culture obstacles so people from the loading dock to the CEO’s office can do their jobs well and be as committed and accountable for the success of the organization as the leaders are. The bottom line is, that many leaders unknowingly create systemic conflict that results in unbalanced systems and strategies and a torrent of inconsistent communications that make it difficult for employees to be engaged and committed to their company’s success. 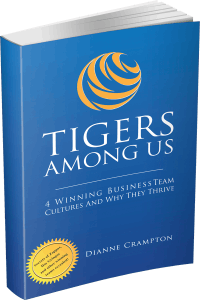 TIGERS provides simple and common sense solutions that demystify the illusive ingredients required for a winning business team culture,” Crampton said. Since the book’s release in March 2010, executives who purchased one book for personal reference turned around and purchased multiple copies for their employees. “I wrote the book as a fast and informative resource that would be easily understood by both leaders and their employees. We also provided free downloadable discussion guides so that leaders could continue the TIGERS dialogue with their teams. This business book strategy was obviously very successful for us and a real win for leaders. Now that we are receiving interest from emerging Asian markets, it is much more convenient for their leaders to acquire the book in digital formats,” said Crampton. Crampton previously published some of here theories as a contributing author in Working Together (Berrett Kohler 2001) and in the 2010 Pfeiffer Consulting Annual (John Wiley and Sons). She was instrumental in the effective merger of warehouse club giant Price/Costco; she played a key role in the merger of Northwest MedStar, and her work with Native Americans was featured at a United Nations sponsored conference for instilling cooperation and excellence in businesses employing workers with diverse cultural backgrounds. TIGERS Among Us takes a rare, in-depth look inside four cutting edge companies: Zappos.com, Dos Gringos, 4Refuel and Tribe, Inc.
Crampton details how both large and small companies can create highly motivated workforces that are collaborative, team-focused and exemplify behaviors anchored by the TIGERS concepts. “While most companies are satisfied with a comfortable market share, these four organizations often achieve market superiority with roaring success,” she said. After each company’s chapter, Crampton offers summary “action items” that businesses and organizations can use to brainstorm and help increase their own success. “It’s no accident that these are highly successful companies. All four have remarkably happy and dedicated employees, from the boardroom to the break room and beyond. The TIGERS values are the key to building ethical, quality-focused, productive, motivated and enthusiastic groups of people inside and outside of the workplace,” Crampton said. Why companies with individualistic cultures are out, and those with collaborative systems are in. Why the human desire to make a difference is rarely tapped by traditional national and international business leaders. How companies can attract and retain happy, hardworking staffs, plus increase profits in a down economy. A step-by-step approach to assess your company, improve team culture, and become more productive and successful. 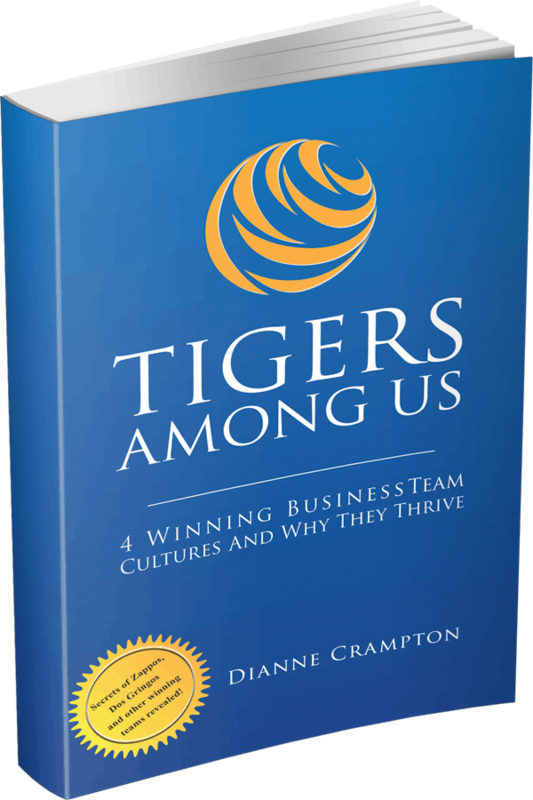 In TIGERS Among Us, Crampton examines the history and development of team culture in business, while providing a foundation for companies to assess and improve their own team cultures. The book’s rare glimpse into the behind-the-scenes workings of four innovative companies in TIGERS Among Us will fascinate and inspire you. Dianne Crampton founded the TIGERS model for teams in 1987. In 1990 she formed TIGERS Success Series (www.corevalues.com) to serve motivated leaders and teams looking for collaborative solutions to refine and improve their teamwork. Through consultation, surveys, games and other innovative techniques, Crampton teaches companies and organizations of all sizes how to evolve from good to great. Crampton is a sought-after professional speaker and featured presenter at national and international conferences. She has also served as adjunct faculty for four Pacific Northwest universities. Crampton has a B.A. in communications from Washington State University, a post-graduate degree in organizational leadership from Gonzaga University, and is a graduate of the Coach Training Alliance. When she’s not helping executives, business leaders and entrepreneurs develop successful collaborative leadership skills, Crampton enjoys travel, gardening and hiking the beautiful high desert of Central Oregon where she lives with her husband and family.